What Exactly Does A Foot Doctor Do? Our feet take a lot of abuse each day. This might be why around 75 percent of Americans will deal with a foot problem at some point in their lives. That’s where a foot doctor comes in. A foot doctor, also commonly referred to as a podiatrist, helps diagnose, treat and manage problems of the foot, ankle and leg. We work with everyone from children to the elderly to help improve foot health. Your podiatrist also performs surgeries and shockwave therapy to treat certain severe conditions that might not respond to traditional or more conservative treatments. When you come into our office, we will perform a thorough exam and discuss the symptoms you are experiencing. 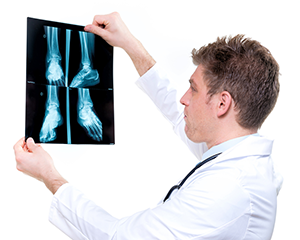 We will also get all of your medical history, including past foot and ankle injuries. We may also run X-rays, CT scans or an MRI to diagnose your condition. Then we will create a customized treatment plan to help reduce your symptoms and improve your overall foot health. From athletes to children with structural problems, we work with any condition and patient to give them the care they need to live a pain-free life. Whether you are dealing with foot pain, diabetes, or you just want to prevent sports-related foot injuries, your foot doctor is able to handle all of your podiatric needs. If you want to find out more about what a foot doctor can do for you, contact one of our offices in Plainville, Danbury, or New Milford Today!